But how does Bernie Sanders win Ohio? 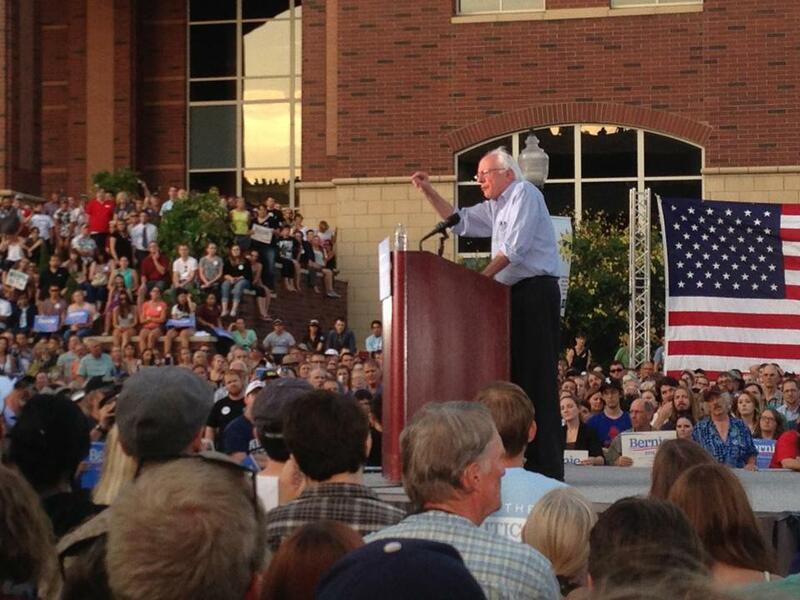 Democratic presidential candidate Senator Bernie Sanders spoke in Nevada on Tuesday. Presidential candidate Bernie Sanders has far exceeded expectations this year. Across the country, tens of thousands of people turn out to see the senator from Vermont deliver a speech. His fund-raising is strong. Polls show him trailing Hillary Rodham Clinton by single digits in New Hampshire — one survey even showed him leading. But if Sanders is going to further his campaign, he must be able to answer one key question: How will he win Ohio? Since 1980, Democratic voters have faced a choice in their presidential primaries: the candidate they love with their hearts versus the person they know in their heads can win. It’s clear from the crowds that for many Democrats, Sanders — and his message of economic populism — is the candidate they want in their hearts. But more Democrats believe Clinton can win a general election — or at least has a better shot than Sanders. It’s an accomplishment that Sanders, a self-described socialist from Vermont who has never been a member of the Democratic Party, has been able to position himself as the alternative candidate to Clinton. He’s drawn the biggest crowds on the campaign trail and received around 35 percent support in national party primary polls (other Democratic presidential candidates, such as former Maryland governor Martin O’Malley, former US senator Jim Webb, and former Rhode Island governor Lincoln Chafee, are getting 2 percent or less). This leaves Sanders with an opportunity — and a challenge that has befuddled similar candidates in past cycles. “For insurgent candidates like Sanders, he needs to take the energy he has now and convert it into a campaign that wins. And very few have pulled in that off,” said Rick Ridder, a Democratic consultant who worked on several presidential campaigns, including for former governor Howard Dean. Going forward, Ridder said, there will be two ways to measure Sanders’ success: fund-raising and campaign organization. Democratic strategist Joe Trippi, who ran Dean’s 2004 campaign, said the Vermont governor’s and President Obama’s insurgent campaigns took flight because they proved they could convert their crowds into campaign infrastructure. In 2003, during this third-quarter fund-raising period, Dean shattered records by raising $15 million. He used that money to increase staff in early nominating states like Iowa and New Hampshire. This helped Democrats view him as a serious contender, Trippi said. The difference with Obama, of course, is that he won the Iowa caucuses. He quickly became the candidate voters wanted in their hearts and believed could win in their heads. One thing that has helped insurgent candidates such as Sanders is technology. Daniel Kreiss, author of “Taking Our Country Back: The Crafting of Networked Politics from Howard Dean to Barack Obama,” said there’s a difference between the way Sanders and Clinton are approaching online organizing in their campaigns. If Sanders wants to be taken seriously by more Democrats, he will need to assure voters he is looking at the long game, experts said. A lead national Sanders strategist, who declined to speak for the record because he said he is not authorized to do so, said the campaign has three goals: Get name recognition, galvanize Democrats, and build out the campaign. The source said campaign leaders believe they have accomplished the first two and will now work on building an infrastructure. But Trippi is skeptical. He said generally 50 to 60 percent of the party goes with the establishment candidate, leaving the rest for insurgent campaigns. Dean was able to become the national front-runner with 35 percent of the vote because the establishment was split among other candidates. Obama was able to use his deep support in the African-American community to eat into establishment support.